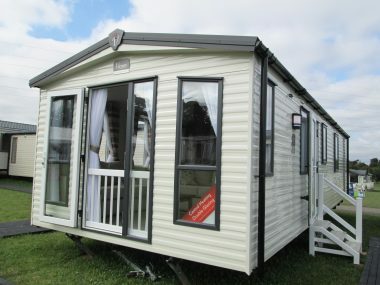 The Grovewood static caravan from Victory Leisure Homes comes in three models, the 33ft x 12ft 2 bed, the 38ft x 12ft 2 bed and the 39ft x 12ft 3 bed. We looked at the 33ft x 12ft 2-bed model. The main access door has an outside light and is flanked by four windows, with four more on the opposite side. The front elevation features a large patio-style swing opening door with glazed side panel and a further two tall, slim glazed windows, at either side. 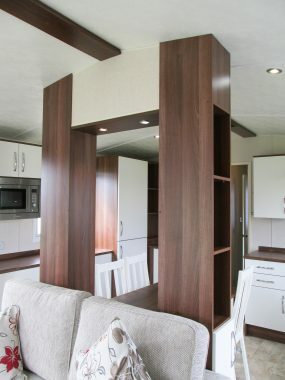 Depending on the caravan park, a deck could also be fitted to the front, as well as down the one side, to extend the useful external area of the Grovewood. Entering through the side access door, you step into the open-plan lounge and kitchen area. To your left is the lounge which is light and airy due to the large windows and vaulted ceiling. The first thing that strikes you is an unusual central unit which has deep shelves and cupboards down both sides and a boxed in top with downlighters and a wide shelf below. This gives the impression of dividing lounge from kitchen without obscuring the view and you’re able to walk around both sides of it unencumbered. The décor on the Grovewood is mainly shades of cream for walls and ceiling, with nicely contrasting dark colours for timber and furniture. Soft furnishings comprise twin free-standing sofas, one of which conceals a pull-out bed; a coffee table, corner TV unit and a beige carpet. Curtains and scatter cushions are a combination of stripes and floral designs with an eye catching deep red accent colour – one of Victory’s trademark colours. The combination might not be to everyone’s taste, but you can’t deny its impact. The kitchen takes up a good quarter of the Grovewood’s total footprint and is arranged across both sides of the home. The dining table and four chairs are positioned in front of that central column unit, leaving plenty of space to walk around the kitchen when cooking or serving meals. The kitchen units are laid out in two ‘L’ shapes. On the side nearest the access door, there’s a stainless steel sink set into a timber effect countertop with cupboards below and a window above. Wall cupboards are on either side and have nice integral downlights fitted to their bases. To the left is the gas cooker with oven, grill and four-burner hob, with an illuminated and vented cooker hood above. Here, there are also more cupboards to the base and on the wall. On the opposite side the other ‘L’ shape has a long length of countertop, with more cupboards below and splitting this is the integrated fridge freezer in its own unit. More wall cupboards are fitted and there’s also an integrated microwave oven at eye level. Well done, Victory! The décor of the kitchen carries on the general theme in this home of dark wood and light doors to the units, which also feature bowed steel handles. A central door takes you through to the bedrooms. First on the left is a small toilet compartment which has a close-coupled ceramic toilet with dual flush and a pedestal handbasin. The corner is taken up with a tall cupboard containing the boiler for the Victory Grovewood, which supplies all the hot water and central heating. The next room on the left is the bathroom. 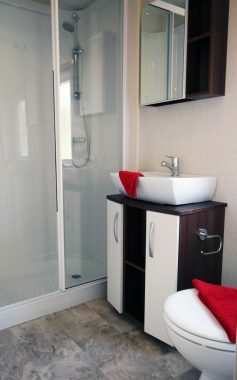 This has a large shower cubicle with thermostatically controlled shower and a large handbasin with cabinet, mirror and storage shelf. It’s perhaps a little different to have the toilet separate from the bathroom, but this would be very useful when there are a full compliment of six staying and everyone’s clamouring to use the facilities in the mornings! Opposite the bathroom is a nice sized twin bedded room, with two beds side by side and plenty of space to walk between them. 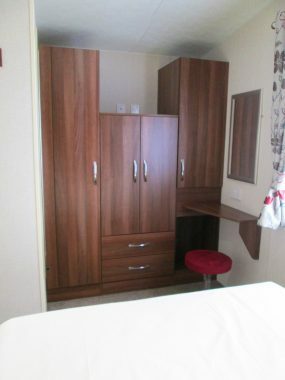 There’s a central bedside cabinet, with table lamp and wall units above the beds, which have twin cupboards and a central shelf. 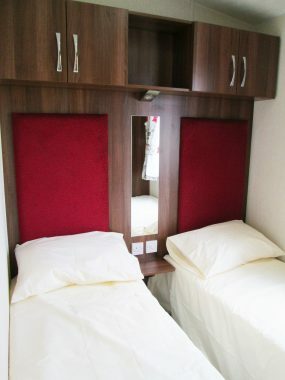 Two headboards, covered in red fabric lead up to the units and there’s a tall mirror fitted in a central position – a very clever use of the space! At the foot of one of the beds is a standard wardrobe. The master bedroom at the back of the home is of a similar design to the twin room and features a double bed, twin side shelves and generous over-the-bed cupboards. Unlike many holiday homes of this size, the bed is set at right angles to the room rather than centrally across the back wall, which allows for a bit more space to fit in a very comprehensive double wardrobe and drawer unit, as well as a corner vanity unit with mirror. Outside, the Grovewood has an apex steel pantiled tiled roof and lapped RVC aluminium coated wall panels in cream. The ever-popular Canexel cladding in a variety of colours can be specified as an optional extra for around £1950 and both windows and guttering can be changed to match whichever colour of cladding chosen. The usual uPVC downpipes and guttering is also fitted and all windows and doors are uPVC and double-glazed, which is now a standard specification on this home. 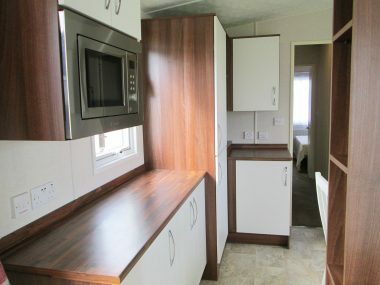 The caravan is constructed to EN 1647 standards and sits on a steel chassis. Pre-galvanised and special Fusion galvanised versions are available as options. The Grovewood is both comfortable and practical and Victory has gone the extra mile to bring a sense of luxurious living at a very keen price point. The Grovewood would definitely appeal to discerning holidaymakers! Décor might not be to everyone’s taste. 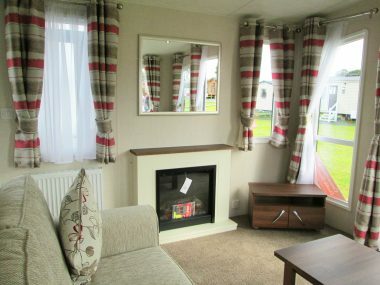 Excellent value for money in a well designed and feature-rich holiday caravan. 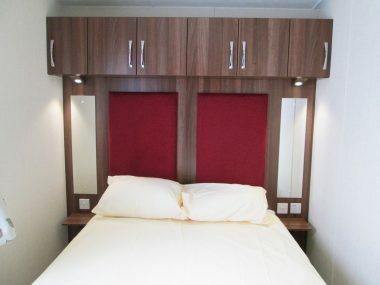 Berths: 4 + 2, in two bedrooms (one twin and one double) plus a further two in a pull-out sofa bed in the lounge. Other layouts available: 35ft x 12ft 2 bedroom; 39ft x 12ft 3 bedroom. Key optional extras: Canexcel external cladding (various colours); pre and fusion galvanised chassis; colour change to windows and gutters to match chosen cladding; bedding packs. Static caravan chassis poll results are in! 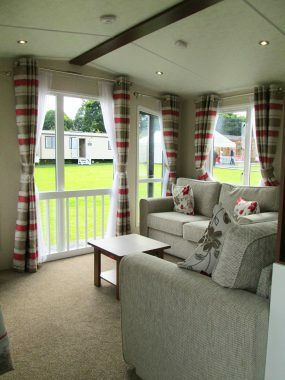 Poll: How wide is your static caravan or lodge? Not one i’d go for I’m afraid, not a lover of dark wood or the central unit post design. Love the large glass doors/windows tho gives feeling of space and red/beige always looks smart. Thanks for your comments Carole. It ticks all our box’s. Bring on the week ends. Saw it at the SSEC at the beginning of the year and loved it. The dark wood combined with the red made it feel cosy. I liked the central unit it made it stand out. Unfortunately I just purchased a new caravan last year or I would have bought it. We fell in love immediately with the 35ft x 12ft – 2 bedroom when we saw it. 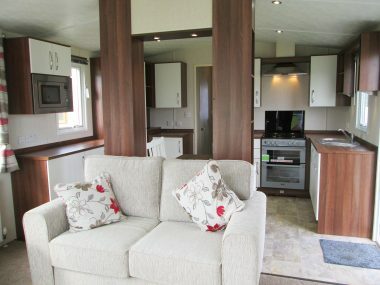 It is perfect, Our previous caravan was a Victory Vision which we had only had for 2 years but the Grovewood was so lovely we just had to change. It has a fabulous kitchen area, but was lacking in electric sockets in certain other areas. (The Vision was better provided with sockets) Love every moment spent in our new home. My daughter thought we were mad changing a 2 year old caravan UNTIL she saw the new one ! 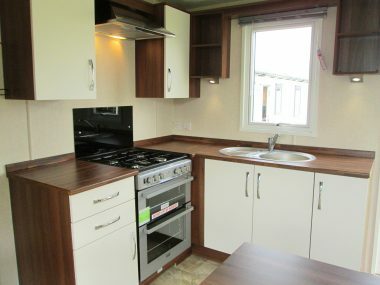 love my victory grovewood 38ftx12ft.well laid out lovely colours.kitchen is brilliant size and also bedroom after owning a Willerby Winchester this one is seven times better.